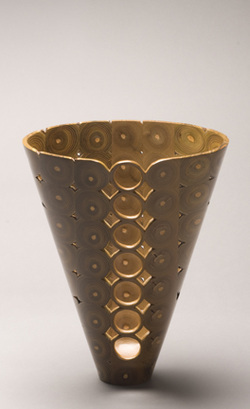 This piece was a finalist for the 2011 NICHE Awards in wood turning. 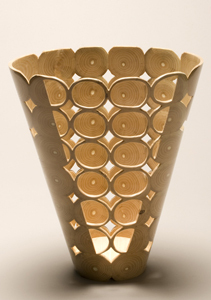 "I chose ash for this vase because of the uniformity of the year rings in the wood. Ash tends to grow straight and round. When I decided to make this piece, I went to the forest to find a tree that was dead and met my criteria. I brought this small sapling back and dried it for over a year. The rigidity of the design coupled with the uniformity of the ash produces a tight yet somewhat whimsical piece." This piece was in the show "Harvest" which opened on Friday, September 13, 2013. Many think of staghorn sumac as a weed and do their best to eradicate it. Jim finds it a fast growing soft wood with very interesting qualities. It has different colours under different kinds of lights. In natural daylight the colour is predominately green but under other lights colours can range from orange and brown to iridescent. "Sumac has always intrigued me. The heart is very soft and sometimes gives way to the touch of a finger. Many times I have found a fallen stick of sumac that is hollow down the center over its entire length. I was wondering how sumac would respond to the carving tools. Sumac does not forgive so I found that I had to proceed with care."